Sending Strength No Matter What! 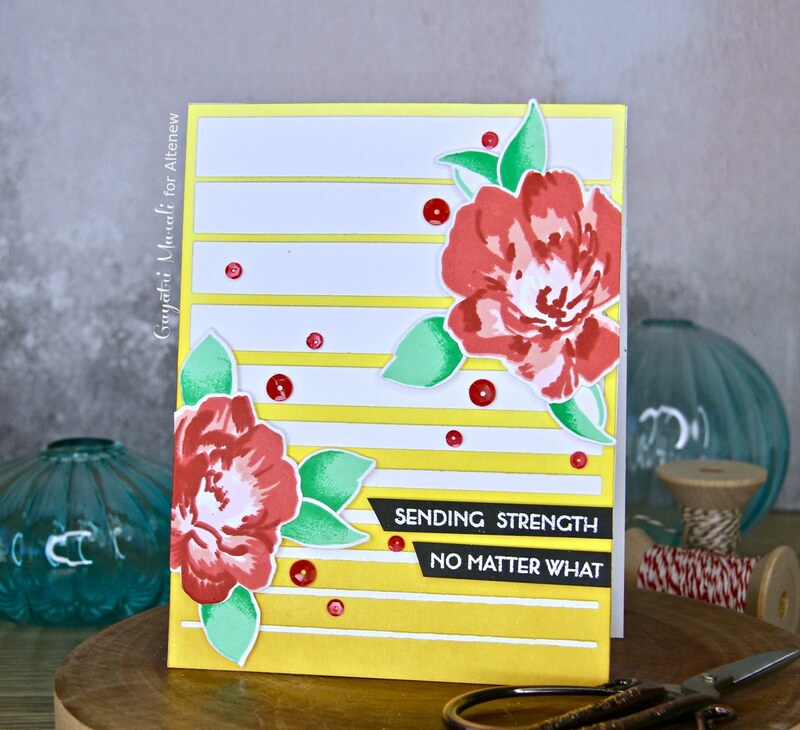 I have a card share today using two new products from Altenew released yesterday. 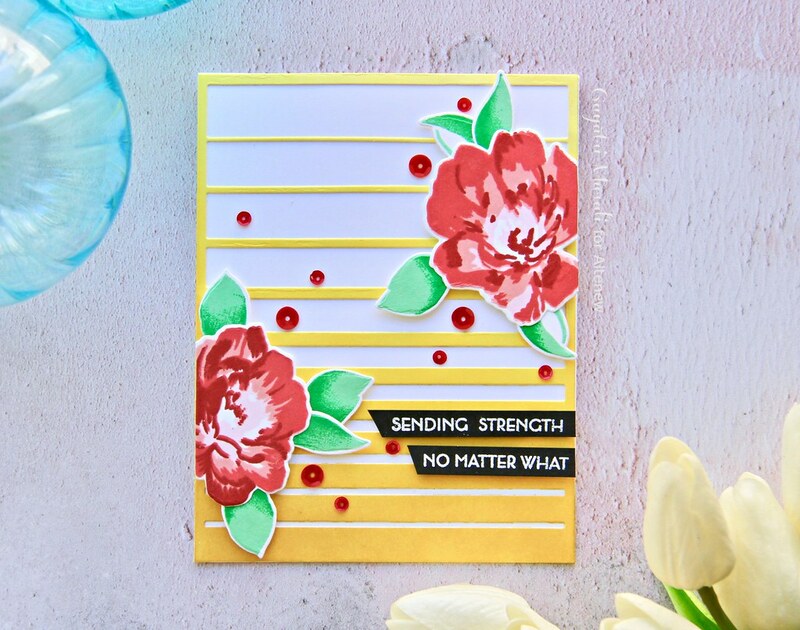 I have used the new Gradient Lines cover die and the Strength Blooms stamp set and coordinating die to make this card. The Gradient Lines die is awesome. I sponged a white panel using Altenew’s Sunshine inks. This ink set has four shades of yellow. I love bright yellow because it makes me happy. The sponged panel has light yellow to darker yellow on the bottom. I die cut this panel using the new Gradient Stripes die. I saved all the negative pieces for later used. I adhered this die cut on the white card base flush. 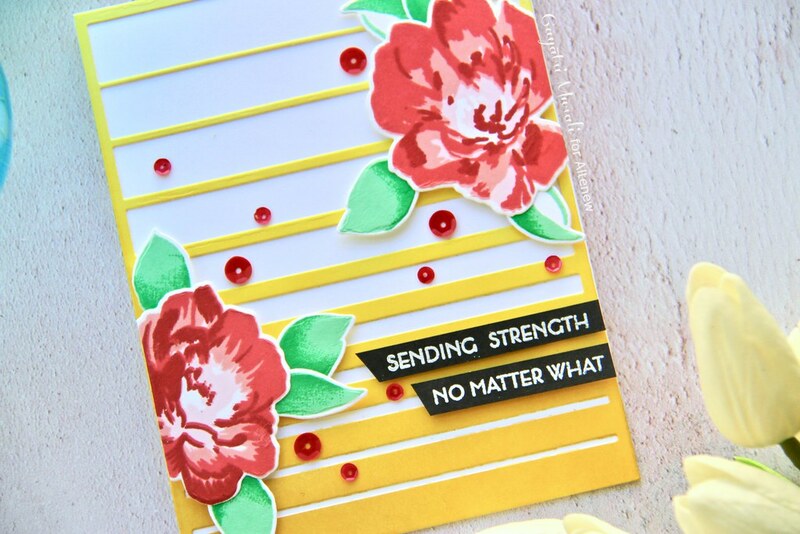 Then I stamped the flowers and leaves from Strength Blooms stamp set on white card panel. I used Red Cosmos inks for the flowers and Sea Shore inks for the leaves. 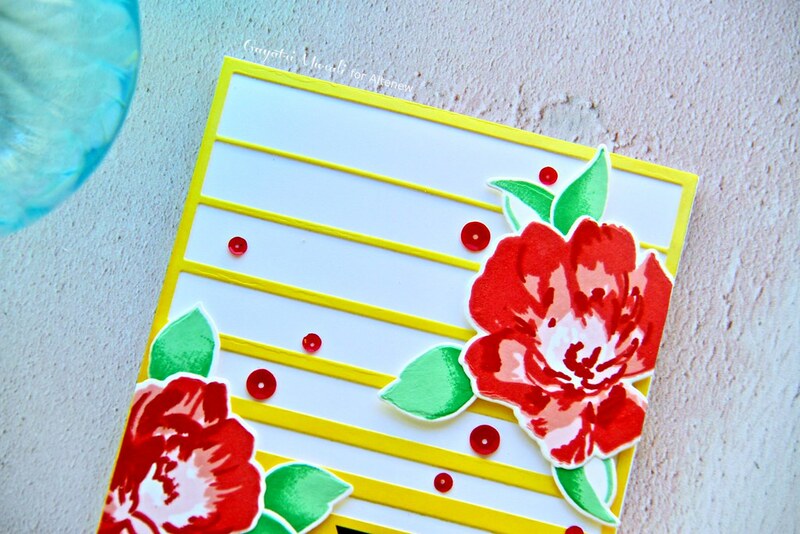 The flowers are layered stamps so the ink set is perfect to stamp. Leaves are single layer and so I stamped them with Volcano Lake ink first and then partially inked the leaves with Lagoon ink to stamp. This gives beautiful shading to the leaves. I die cut the leaves and flowers using the coordinating die and adhered to the bottom left and top right corners of the card front slightly offset. The overhangs I trimmed off. The sentiment is white heat embossed on strips of black cardstock and adhered on the bottom right in two layers. I then added red sequins to tie both the flowers and bring the card together. Here are some closups of the card. I love the bright summery colour combination on this card. These colours remind me of one of my wedding sarees. No black though but the red, green and yellow are very typical go to colours for weddings outfits. I still have the saree and haven’t worn it since my wedding! Time to pull it out and wear for an occasion. All the supplies used to make this card are listed below. Thanks so much for visiting my blog today. Enjoy your day! Very nice card. I love this release!